If you have been to Korea once or more, you might find it hard to deny that Korea is one of the front runners in terms of technology. Almost everyone on the street or in the office seems to be enjoying their smart phones. If you have one, you can get help from the palm-sized device without difficulty. The use of the smart phone might be open-ended and its users are waiting to see what comes next. For some reason, all walks of life from office workers to housekeepers consider a smart phone as a must-have item. They always carry their phones with them. You may not be able to imagine someone takes your property from you. Suppose every morning someone takes your phone away for 8 hours. On top of that, let’s say it’s a smart phone you’ve recently bought downtown. You won’t easily give up your ownership, and you may even argue or fight with the person who is going to keep your phone. This is what happens every morning in many middle schools in Korea. Frequently, I even have to wrangle with a couple of my students. It is a school rule for homeroom teachers to pick up their students’ phones, but some smart phone lovers never give up. Every now and then, this leads to a nasty tug of war between a teacher and a student. The school administration strongly believes that phones keep students from focusing on their lessons. Although it’s a rule, I cannot help but feel sorry for them. It is no surprise that those frequent ugly scenes help breed anti-teacher sentiment among students. The invisible conflict between the two parties might affect the classroom atmosphere at well. I have seen a student tempted to look up an English word in his phone which survived in the morning pick-up. He and I were in a tricky situation because I have to keep his phone away for a week or more as a punishment if I see him possess it though he may use it with goodwill. My choice was to warn the whole class, including him, against phone possession. In my after-school classes, I used to let my students look up English words in their phones. Surprisingly, they eagerly joined the activity in a voluntary competition. In no time after I allowed them to use their mobile buddies, all of my students in the classroom started to speed up their search for words and ended up competitively checking and even comparing what they had found. Those who finished their work even helped their slow classmates with some nice jokes instead of teasing or blaming. Plus, it helped save time for the next classroom task. It was an unexpected success! Then I became confused and wondered if cell phones are helpful or harmful for English classrooms. The presence of smart phones in English class may make many activities possible other than just looking up vocabulary. For example, students can do an activity to find examples or references using their phones. Sometimes, they can be better than the teacher in searching for information as most of them are born to play with computer. They can also provide the teacher with valuable sources they come across at any time during the class. In other words, the class can be not only active but also interactive. 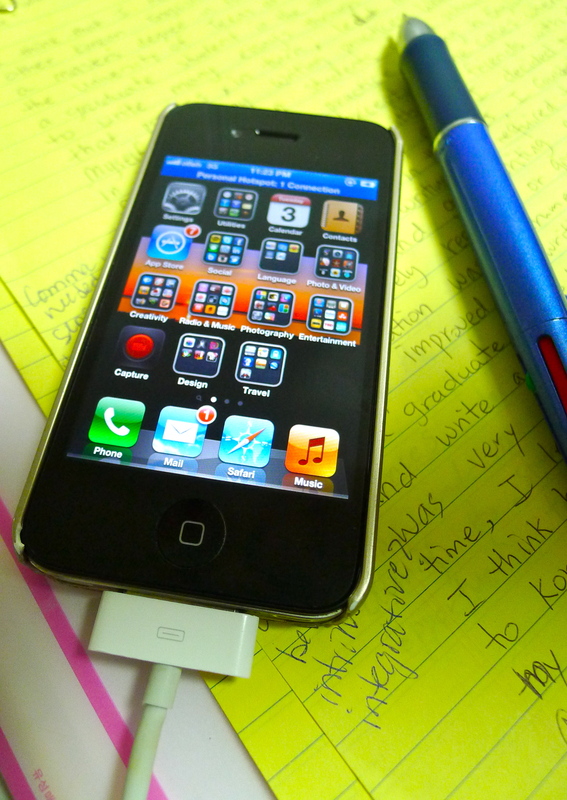 More activities may come out when students can have smart phones with them in class. I know there are many concerns about the use of phones in class. However, I have heard some high school English teachers allow their students to use their phones in class. I doubted its efficiency when I heard that, but now recalling my experiences I’d like to approve the use of smart phones in class. Interesting topic. Indeed technology has become very helpful in every aspect of our lives, if it is used appropriately. I do think it is safe to use smartphones in English class, but not in Math class (exemption in classes with Algebra, Calculus, Physics and other more complex mathematical tasks). A student can use smartphone to lookup for word meanings. However, it destroys creativity and capability of a student who is looking for an easy math solution. Smartphones have replaced atlases so it’s a handy reference tool in Geography, History, Science, and a range of subjects, but it should not replace traditional and existing teaching tools and methods. The key is schools should come up with official smartphone rules, e.g. turn your phone to silent or vibrate mode; no games while in class; no sms/chatting; etc. The rules can be read out in an assembly by a high-rank male school authority (Confucianist/patriarchal culture) and posted in every classroom. Thank you for your thoughts on her essay. I connected to what you said about accessibility perhaps getting in the way of creativity. When used as a crutch, it does have this potential. However, if we were to trust the students’ desire to learn as a result of their curiosity, perhaps these issues would never come up. There is a lot to consider and I’m glad that the conversation is out there. THank you for sharing your thoughts here. Someday students will be so engaged in their learning and teachers so focused on student productivity that any and all tools will be welcomed in the classroom. I think she makes a good point, that when the use of the phone is directed towards the subject, it can enhance the learning experience. It does, however, imply that all the students will be using the phone to complete the task, rather than texting in Korean, playing games etc. As for me, I have to say that I would love to let my students use their smartphones. In fact, I have an extra class where one of the things I’m doing is to get students to pick a topic from a magazine, expand on the topic by searching the web, and then presenting their topic to the rest of the class. In the beginning, the students I had there were amazed that I would allow them to use their phones, and not only that, but encourage them to use it. I’m also going to use this technique for the summer camp, where I’m going to get students to stay in e-mail contact and chat contact with three students who are going to spend some time in London. So much of the ban of smartphones stems from the fear I expressed above, that students will waste their time not doing the required work for the subject. It shows how ignorant administrators and, unfortunately, many teachers are when it come to motivation – when, as described, there is competition, curiosity and an open spirit in the class, students will amaze you with what they can do. I enjoyed reading about the way you encourage and celebrate exploration in your classroom, Leonie. I love the idea of enouraging them to stay connected with peers in London: an authentic connection via an authentic mode of communication will surely bring more meaning to the language they are practicing. Your students’ surprise is a clear indication of their negative experience with past administrators. It saddens me to think that exploration and trust are not an integral part of most education systems. Perhaps it is through the small trials of teachers such as you that will help future administrations see the relevancy of these concepts. Keep exploring Leonie! Yes, smartphones are very useful in a language class particularly when you are short of dictionnaries, or PCs ! I agree. Unfortunately our program hasn’t had the funding to purchase enough dictionaries, but the beauty is that most students have a smartphone dictionary anyway. I often get my after school students to look up facts / information on the web using their phone. I think that if they can be incorporated in a positive way into classes then it’s great. When you have big classes it’s a lot more difficult to monitor and I agree with phones being banned in main classes! Yes, it definitely seems to be a monitoring issue. I’m not sure I could even trust myself not to wander off to Facebook or Twitter during class…lol. How could I expect young students to be able to hold back from online guilty pleasures. You are witnessing a change in how teaching will be and for our age group change is difficult. I work as a consultant in the education field and see the reluctance of the education leaders to allow this use in classrooms in general. Is it the fear of the unknown? Is it the fear of not having the control? I am talking from a North American perspective but I can assure you one thing, change will happen! Change is universal with the perfection of technological advances. Do not fear, help lead it in a positive mannner. Thank you so much for sharing your experience! I especially connected to this comment, “Change is universal with the perfection of technological advances.” There is no doubt about this. When we look at the way technology has so quickly changed the way we interact and go about our daily lives, it is amazing to think that this has not been integrated into school systems. There is no doubr that funding issues play a part in this, but it seems that there are ways to get around this. I’d love to hear your thoughts on this. What are some possible ways that school budgets could be shifted in order to make room for the technological changes that need to happen? Phone use in the classroom is always a touchy subject. My elementary and middle school students had their phones taken away from them when they entered our English camp. A few of them compensated by using mp3 players or iPod touch devices. These nearly always proved beneficial for the whole class. Students used iPods to play English pop music and download lyrics that the whole class could then learn and incorporate into end-of-camp performances. They also used them to record any activities in which they were required to memorize something so they could study in the dorms after class. I think the use of internet-devices really benefited the class. My university students were allowed to keep their phones in class. There was a lot more freedom in their use. We played games in which phones were integral, for example: students would record their self-introductions, put all the phones in a bag, and try to identify the owner of a phone chosen at random by listening to their self-introduction. However, there were also problems with phone use – students would send text messages to their friends or take phone calls during class. Often students forgot to put their phones on ‘silent’ or ‘vibration’ mode. Rarely, students tried to use their phones to cheat on exams. But for the most part, students used their phones as learning tools – for looking up words, recording themselves, making videos of role plays. I think smart phones are too valuable as learning tools to ban them from the classroom and it’s sad when teachers are required to do so.